The Norwegian government, via the Ministry of Foreign Affairs and the Norwegian Agency for Development Cooperation (NORAD), provides tens of millions of kroner (NOK) through direct and indirect funding processes to politicized NGOs operating in Israel, the West Bank, and Gaza. Norway prohibits funding for “discrimination, including hateful expressions and anti-Semitism” and commits to not funding organizations that “expressed key goals to promote the BDS campaign.” Yet, many Norwegian-funded NGOs are active in BDS (boycott, divestment, and sanctions) campaigns and promote anti-peace narratives and “lawfare” campaigns at the ICC. Some groups have also used antisemitic rhetoric and have apparent links to terror organizations. 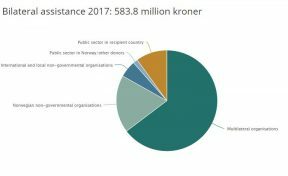 The Norwegian Ministry of Foreign affairs grant portal provides details of ongoing and new projects for the current year. Previously funded and completed project information can be downloaded from the “Access to microdata” of the Norwegian Agency for Development Cooperation. According to information available on the Norwegian Ministry of Foreign Affairs/NORAD website (as of April 17, 2018), the Norwegian government committed funds of over NOK 200 million (over $24 million) to politicized organizations active in the region for 2017. These funds are distributed via NORAD, the Embassy in Tel Aviv/Israel, the Representative Office in Al Ram/Palestine, and the Ministry of Foreign Affairs. In 2017, overall development aid to “Palestine” amounted to NOK 583 million. PCHR describes Israel’s policies as “apartheid” and accuses Israel of “ethnic cleansing,” “war crimes,” and the “Judaization of Jerusalem,” while regularly distorting or denying the context of terrorism against Israeli civilians. In an interview, Raji Sourani admitted that he served “a three-year sentence [1979-1982] imposed by an Israeli court which convicted him of membership in the illegal Popular Front for the Liberation of Palestine…” He was also denied a US entry visa in 2012. Promotes a one-sided approach to the conflict, placing sole blame for the failure of the peace process on Israel. The complexities of the situation in Jerusalem are erased, including illegal building and crime in Palestinian neighborhoods, damage to the Temple Mount as a result of illegal digging by the Waqf, and incitement to violence against Jews by extremist clerics. *Categorized as “Middle East Regional,” exact location uncertain. Lobbies international frameworks against Israel and supports BDS. Addameer is an official PFLP “affiliate,” and a number of Addameer staff members have alleged connections to terror groups. Addameer’s chairperson and co-founder, Abdul-latif Ghaith, was banned by Israel from travelling internationally due to his alleged membership in the PFLP. He was also banned from entering the West Bank in 2011-2015. Al Haq is a leader in anti-Israel “lawfare” campaigns and BDS activities. General Director Shawan Jabarin is allegedly linked to the Popular Front for the Liberation of Palestine, a designated terrorist organization by the U.S., EU, and Canada. Click here to read NGO Monitor’s unofficial translation of the decision by the Israeli High Court of Justice. In March 2013, published an article written by Nawaf al-Zaru that repeated the antisemitic blood libel that Jews use Christian blood to bake Passover matzah. After significant public criticism, MIFTAH removed the article, but attacked the blogger who exposed the article for “smearing” the organization and downplayed the centrality of the blood libel in the article. Supports BDS initiatives through participation in activities and events, signing of petitions and initiatives, and membership in BDS platforms. 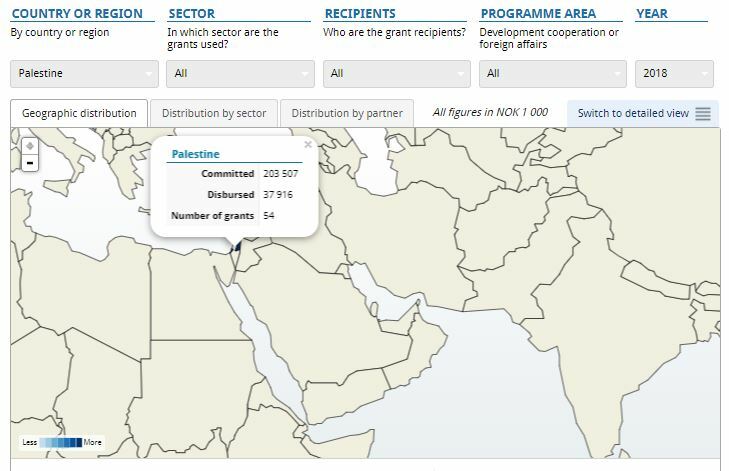 The Embassy in Tel Aviv does not publish details on NGO funding. According to information submitted by Israeli NGOs to the Israeli Registrar of Non-Profits, the Embassy allocated NIS 23 million to Israeli NGOs from 2012-2017. Actively pursues its political agenda in the Israeli courts and the Knesset. In October 2016, Hagai Elad appeared before a special session of the UN Security Council initiated by Egypt, Malaysia, Venezuela, and Angola, asking the UN to take “decisive international action” against Israel. In his presentation, Elad made no mention of Palestinian terror attacks or incitement. Norwegian Refugee Council (NRC) has been active in Israel, the West Bank, and Gaza since 2009 and has offices in Jerusalem, Ramallah, Hebron, and Gaza. The organization employs 12 international staff and 106 national staff. In 2017, NRC’s overall budget for its Israel, West Bank, and Gaza specific programs was $16.5 million (128 million NOK). According to UNOCHA, during the period of 2016-2017, NRC received $33.8 million in government funding for projects in the region. NRC supports politicized “Litigation of public interest cases …through Israeli courts and international mechanisms” in 2016. Previously, NRC funded over 4,000 cases and legal interventions in Israeli forums. NRC works with a narrow selection of political NGOs that promote a one-sided narrative of the conflict in implementing its legal aid and “public interest litigation” related programs. In 2016 and 2017, NRC partnered with HaMoked, JLAC, Society of St. Yves, Terrestrial Jerusalem, Yesh Din, CAC, Bimkom, Palestinian Centre for Democracy and Conflict Resolution(PCDCR), Palestinian Centre for Human Rights (PCHR), Al Mezan, among others. Through its Standby Roster for Civilian Observers (NORCAP), NRC “contributes” to Temporary International Presence in Hebron (TIPH). In addition, in 2018 TIPH received NOK 5.7 million from the Norwegian MFA. NPA is a leader and mobilizer of anti-Israel BDS (boycotts, divestments, and sanctions) campaigns. Played a central role in lobbying the Norwegian Government Pension Fund Global (GPFG) to divest from Israeli companies “involved in building activities in the illegal settlements,” promoting distorted factual and legal claims. In April 2017, NPA hosted Al-Haq’s General Director, Shawan Jabarin, who has alleged ties to the PFLP terrorist organization and as such has previously been denied exit visas by Israel and Jordan. Identified by Fatah as an official PFLP “affiliate,” and by USAID as the “agricultural arm” of the PFLP. PNGO is the Palestinian NGO umbrella organization comprising 67 Palestinian organizations. PNGO requires that members refuse to sign US anti-terror waivers prohibiting them from accepting “anything but unconditional funding.” In June 2017, PNGO condemned Norway’s decision to pull funding from a youth center named after Dalal Mughrabi, a terrorist who murdered 37 Israeli civilians in 1978- including 12 children. Other NGOs include: Palestinian Center for Democracy and Conflict Resolution(PCDCR) and Democracy and Workers’ Rights Center [Association] in Palestine (DWRC). Published a “Country plan 2011-2015: The occupied Palestinian Territory with Israel and faith-based organisations in the Middle East,” together with the ACT Alliance, presenting a highly biased and politicized view of the conflict and accusing Israel of “excessive use of force,” “demolitions,” “displacement,” “harassment,” using “human shields,” and promoting the Palestinian narrative of “Nakba” [meaning the establishment of Israel is a “catastrophe”]. NCA sends Norwegian members to the World Council of Churches’Ecumenical Accompaniment Programme in Palestine and Israel (EAPPI). Founded by the World Council of Churches, EAPPI sends volunteers to the West Bank to “witness life under occupation.” Upon completion of the program, the volunteers return to their home countries and churches where many engage in anti-Israel advocacy, including advocating for BDS campaigns in churches, comparing Israel to apartheid South Africa and Nazi Germany, and other delegitimization strategies. EAPPI volunteers have used inflammatory, demonizing, and antisemitic rhetoric against Israel. Supports the Kairos Palestine document, which characterizes terrorist acts of “armed resistance” as “Palestinian legal resistance,” denies the Jewish historical connection to Israel in theological terms, and calls to mobilize churches worldwide. Partners with EAPPI (see above). Initiates international BDS campaigns, targeting Israeli and foreign banks, security companies, civil infrastructure facilities, and private companies. Also identifies companies for other BDS activists to target. Norway has strongly condemned a WATC youth center named after a terrorist, and has demanded that all funding allocated to the center be repaid. This is an important example for other government funders of groups that glorify terrorism. An analysis of Norwegian funding to international, Israeli, and Palestinian NGOs active in the Arab-Israeli conflict. European governments have been attempting to change Israeli policy on contentious issues relating to the Arab-Israeli conflict by manipulating Israeli democratic processes through secretive, non-transparent means. Norwegian NGO Funding: Peace and Coexistence, or Boycotts and Apartheid Rhetoric? Norway is a significant donor of humanitarian and development funds to the Palestinian Authority. However, some of this money is provided to NGOs that are engaged in intense political advocacy campaigns directed against Israel, as shown in this detailed analysis.